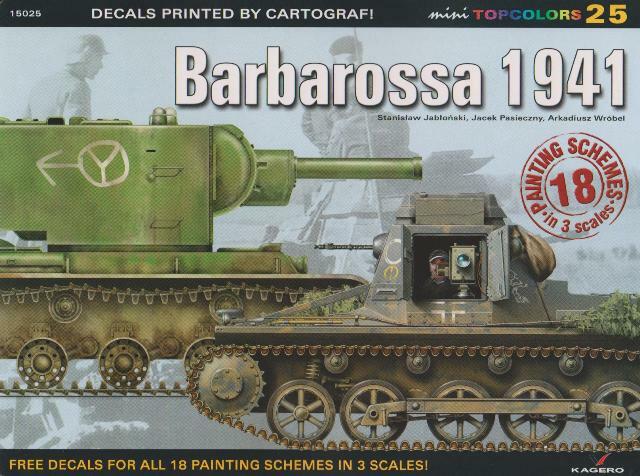 Recommendation: This is an excellent package that allows the modeller to build a variety of subjects from both sides of the Barbarossa campaign. Many armour modellers like to build their subjects around a theme. Popular examples are the battle of Kursk, operations in North West Europe, or the conflict in North Africa. To save the enthusiast from purchasing a multitude of decal sheets and the accompanying reference material, Kagero have introduced the “Top Colours” series of books. This particular package is the “mini” version and concentrates on the 1941 German invasion of the Soviet Union, code named operation “Barbarossa”. Unlike its larger sibling, text is kept to a minimum so those requiring an explanation of this campaign are best directed to other sources. But what we do get is a varied selection of 18 vehicle profiles and associated decals, from both sides of the conflict. Kl. Pz.Bef.Wg. Sd.Kfz.265 of 11 Panzer Division, summer 1941. 15 cm s.I.G.33 SFI auf Pz.Kpfw.I Ausf.B of 706th Self-propelled Heavy Infantry Gun Company, 10th Panzer Division. 15 cm s.I.G.33 SFI auf Pz.Kpfw.I Ausf.B of 702th Self-propelled Heavy Infantry Gun Company, 1st Panzer Division, Russia, summer 1941. STZ-built T-34/76 model 1941 with F-34 gun coded 4 of 21st Independent Tank Brigade, autumn 1941. STZ-built T-34/76 model 1941 with F-34 gun. Painted in 4BO dark green with a white inscription “Beat the fascists” on the turret sides. 1941-built heavy tank KV-2 captured by the German 7th Panzer Division in July 1943. Pz.Kpfw.III Ausf. G coded “white 14” of 11th Panzer Division, Eastern Front 1941. Pz.Kpfw.III Ausf. H “531 (black outlined in white)” of 6th Regiment, 3rd Panzer Division, Eastern Front 1941. Pz.Kpfw.III Ausf. J, “white 1K” of 11th Panzer Division, Eastern Front, Ukraine, July 1941. Pz.Kpfw.III Ausf. J, “white 632” of 18th Panzer Division, Eastern Front, September, 1941. Pz.Kpfw.III Ausf. J, “white 5 (621)” of 10th Panzer Division, Eastern Front, late autumn, 1941. Pz.Kpfw.III Ausf. J, “white 7 (731)” of 10th Panzer Division, Eastern Front, summer, 1941. Pz.Kpfw.IV Ausf. D, “white 33” of 11th Panzer Division, Eastern Front, Ukraine, July 1941. Pz.Kpfw.IV Ausf. E, “white 11” of 11th Panzer Division, Eastern Front, Ukraine, July 1941. Sd.Kfz. 250/3, of 11th Panzer Division, Panzer Group 1, Eastern Front, September 1941. Sd.Kfz. 221 of SS Division “Wiking”, Eastern Front, summer, 1941. Pz.Kpfw.II Ausf. 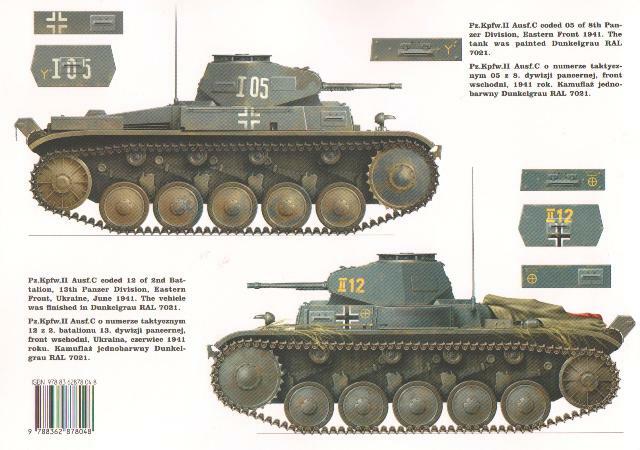 C, “white I05” of 8th Panzer Division, Eastern Front, 1941. Pz.Kpfw.II Ausf. C, “yellow II12” of 13rd Panzer Division, Eastern Front, Ukraine, June 1941. Each vehicle is the subject of some beautiful artwork. In most cases, one vehicle per page is displayed and is backed up by a cropped period photograph. 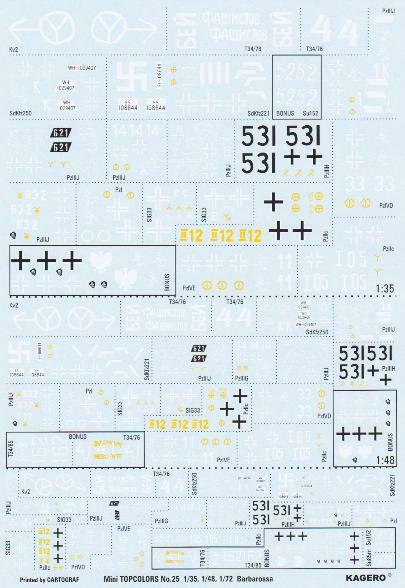 The decal sheet contains markings in 3 different sizes and represents each of the popular scales… 1:72, 1:48 and 1:35. Cartograf are responsible for these, and it’s quickly obvious that their high standards have been maintained. Everything on the A4 sized sheet is in perfect register and the carrier film around each item has been kept to a minimum. If you want to model the armoured vehicles of a single campaign then this is a series worth considering. It allows the modeller to build a variety of tanks from one of the most defining periods of WWII and is a great way to start building a collection based on a theme.